Once outside its flowerpot, the tree ceases to be a bonsai. Alejandro Zambra is acclaimed as the greatest writer of Chile's younger generation. He is a poet and critic and currently teaches literature at the Diego Portales University in Santiago. "Bonsai" is his first novel. It was awarded Chile's Literary Critics' Award for Best Novel. 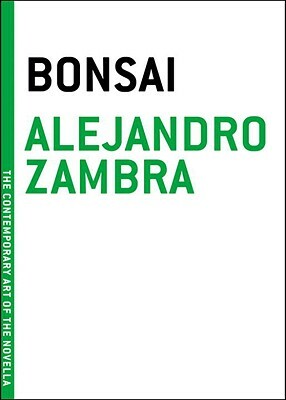 "The ‘last truly great book’ I read has to be Alejandro Zambra’s Bonsai. A subtle, eerie, ultimately wrenching account of failed young love in Chile among the kind of smartypant set who pillow-talk about the importance of Proust. You get the cold flesh of the story in that chilling first line: “In the end she dies and he remains alone, although in truth he was alone some years before her death.” But only by reading to the end do you touch the story’s haunted soul. A total knockout. "The herald of a new wave of Chilean fiction." "Bonsai is an appealing miniature, a novella that, despite its brevity, feels airy and full … an enjoyable, pleasantly surprising, and clever read." "Bonsai won the Chilean Critics Award for best novel of the year in 2006…and it's easy to understand why." "What is remarkable about Zambra’s novella is the space between ending and beginning—the progressive prose that relates a true story with emotional and artistic implications extending far beyond its 83 pages." "Zambra flexes some serious artistic muscle...."
"For such a small book to have such well-rendered characters is impressive and this, in the end, is what is essential to the novella. A good novella must impress you with its tiny size and the power of its language." "Undeniably fascinating...the kind of story that lingers in the mind for weeks after being read."